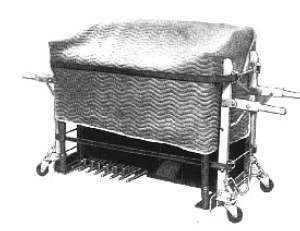 Roll-Or-Kari's are a brand of organ dollies. The come in pairs, and are designed to be strapped on to the organ, one on each end. 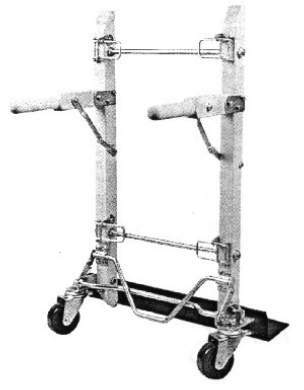 They have wheels which jack down (the Roll part), and very comfortable flip up handles (Kari). Once you have used a set, you will not want to move an organ without them ever again. They come in several models. The bottom bar is available in (at least) two widths. If you plan on moving any B-3's you'll need the wide version, since the narrow one will not span the legs. You can also get models with swiveling (steerable) wheels on either one or both sides. Some equipment rental houses have them. Usually asking for "Roll-Or-Karis", though, will get you nowhere --- try asking for organ dollies. Last edited on February 16, 2003 4:33 pm.